My kids and I regularly filk songs to song while we work. It’s not a conscious thing, just a wierd idiosyncratic family habit. My chicken feeding song comes from the BBC show Red Dwarf. The reason this surfaced in my consciousness probably revolves around the division of livestock and pets for me. Chickens are not pets. The whole back yard chicken movement has puzzled me many times. I grow vegetables because I like quality food. I grow chickens because. …I like quality food. Now is that the only payback I get from chickens? Heck no. Last year a family of raccoons came up from the sewers while the river was high. Over the course of a month, they devastated my neighbor and my flocks. It was heartbreaking, frustrating, and maddening. After careful discussion with my husband I chose to not have chickens again until this spring. I learned a great deal about why I value them during those months. First, the weeds! Good Lord I thought the yard had a lot of work but I soon discovered that the chickens really carried their share of it. The weeds went crazy. All their foraging took hours and hours a week of my chore time. I knew they helped but that is an understatement. I can’t keep up without them. Second, I’ve eaten some horrible omlets. Thankfully my neighbors restocked their flock right away and by fall I was getting some decent eggs again. The free range chicken eggs at the store are that in name only. No good. Bland. Ugh. Lastly, it was lonely. When I go out in the morning they clatter around and beg for scratch and scraps. 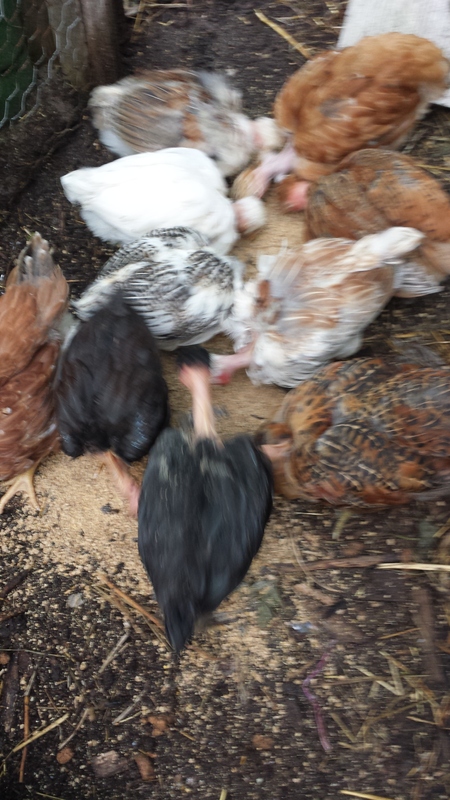 My kitchen scraps no longer go to waste and the flock of chickens at my feet make me feel relaxed and centered. I love keeping chickens. So much so, I texted my brother while waiting for them to be ready for the coop with “I rediculously love keeping chickens”. This morning while letting them out I received a text back, ” I ridiculously love keeping cows” with a picture of a brand new wet baby cow lying in a pasture. Beautiful big round eyes starting into the camera from a creature just hours old. Looking into that babies eyes, I know, however, that if it’s a boy he’s future steaks and hamburgers. Is that sad? Not if you ask my sister in law. They only eat meat they raise so steaks and hamburger are an uncommon commodity. In the city, we run to the store and pick up a tidy plastic covered package and take for granted the big eyed little calf that went into it. Maybe we should all know our food and be given the opportunity to cherish it more. Why aren’t they pets? Well they aren’t bred to emotionally give back. They have a function that is super important and that isn’t it. Humanity developed domestic cows and chickens to meet a need. Nutrition, commerce, and sustainability are their function. Humanity domesticated dogs for companionship. Cats too, although maybe cats domesticated us. My dog shares his day, reads my moods, helps me or with protection and chores, and injects himself in my personal space when he thinks I need emotional support. My chickens think maybe my toes are grubs. They don’t weed because I like it. They weed because they are eating machines. They eat bugs because. .. hungry. They cluster around me because I have food. Racoons, cats, hawks, and possums come to my yard because they are food. Just like loosing fruit from my trees to birds, I’m going to lose some chickens to predators. I’m part of an ecosystem. A style of ecosystem that has been around thousands of years as a matter of fact. I would love if predators didn’t come in and think chicken tasted good. It breaks my heart to loose any of them, but it is what it is and it’s natural. I am often asked what the biggest thing a budding chicken keeper needs to know. I always answer that chickens taste good to everything. Even though they often seem like miniature dinosaurs roaming the backyard, they can’t defend themselves. Roosters do a pretty good job and I recommend finding one that you can live with, but in an urban setting it isn’t necessarily possible. Your neighbors might value quiet over your food security. Most of the people around you aren’t really thinking about food security or the realities of the process. The laws probably won’t be in your favor, so you have to wrap your head around some losses. Just like with fruit trees. The birds are going to take what they want. With fruit it’s easier though. Now, the second thing I’ve added to this list is DON’T KISS CHICKENS! Seriously, I’m horrified that this has to even be said. Honestly, they are cute when little. They are eating pooping machines though that are hatched in a mass production incubator and you don’t know what kind of hygiene the facility you got them from has. If you got them from the feed store, you don’t know what they have been exposed to. Don’t kiss them. Wash your hands. Use common sense. This is the type of thing that makes it hard to have open chicken laws. It boggles my mind that people would think to do this. I understand giving a chicken a bath (which I also find crazy) because I was in 4-H and understand showing animals. Don’t kiss them. Clean the coop. Keep their living area clean. After they stop laying cook them in wine and cherish their service. We have these wonderful animals to help us on their journey. Care for them ethically and value them. When I see my chickens I may be a little cold hearted for our current culture of city living. I grew up in a place and time where I feel I understood their cycle of life and purpose though. I just can’t see these creatures as a thing to cuddle and pet. It freaks most of them out anyway and causes them stress. I want my chickens to be happy, healthy and well taken care of. I want to eat eggs that explode with flavor. I want to eat chicken that tastes nothing like the ones bought at the store. I want the girls to survive and become a delectable coq au vin. They have an honest wonderful purpose we don’t have to apologize for. I should add that she is a heifer calf. She’s half Jersey, half shorthorn so she won’t milk worth a darn and won’t make a lot of beef but she will make babies. I suspect her daughters will be 3/4 Jersey and will be pretty sound milkers. But there is always the possibility that she will be one of those few calves that won’t stay in the fence, has a violent disposition or is biologically susceptible to parasite infestation. In which case, she’ll be delicious. As Isaiah says, all flesh is grass. We have lost birds to owls, skunks, foxes, raccoons and even a mink. A cat got in our brooder and killed 30 chicks one year. But as you say about having chickens in the yard, I am lonely when the cats are not underfoot. I want to hear owls hooting in the woods. There is a place in the farm for coyotes and foxes and raccoons (skunks are on their own). I have to be careful to gently insert myself into the ecosystem as an enhancement rather than force dominance on the landscape. I’m here to make it better, not to make it sterile and safe.